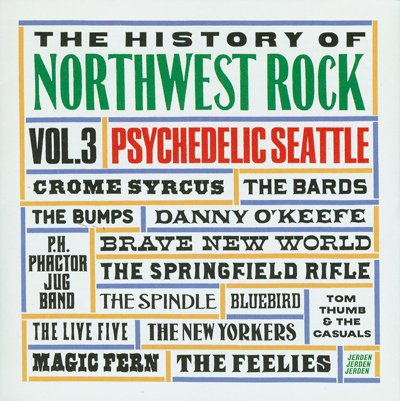 AN EPIC ARCHEOLOGICAL EXPEDITION into Seattle’s senior pop label’s master tape vaults yielded this selected set of twenty-two Northwest rock songs from the Psychedelic Sixties. It is a kaleidoscopic mix of classic regional radio hits, half-forgotten obscurities, and recently rediscovered long-lost nuggets. THIS REGION'S TEEN-R&B BEGINNINGS were tracked on Volume I of Jerden Record’s History of Northwest Rock series, The Original Northwest Sound 1959-1964 (Jerden 7002) and the second installment, The Garage Years 1963-1967 (Jerden 7007), documented how, later, local musicians forged a brutal new aesthetic that came to be known as garage/punk rock. Finally, this third volume presents a mind-blowing flashback to a time when our local sounds were being impacted by influences as disparate as flower power folk-rock, Mersey Beat mania, paisley-powered psychedelia, old-timey jug bands, acid rock freak-outs, and back-to-the-country rock. Yet as we shall see, the region’s bedrock teen-R&B tradition never gave way entirely here in the Northwest. Psychedelic Seattle 1965-1969 takes us on a trip back to a wondrously tumultuous period in American history when all sorts of established notions were challenged by “beatniks,” “fringies,” “peaceniks,” and “hippies.” Hair was grown. Guitars got fuzzy. Authority was questioned. Free Speech was reasserted. Civil Rights were won. A war was stopped. Banana peels were smoked. And…for just one shining moment – and against all musical odds – harpsichords and sitars came together to jam in perfect peace! Weird and wonderful times!!! Ground zero in the cultural upheaval was, of course, San Francisco, which gained notoriety for its mind-bending Light Shows, eye-straining psychedelic Fillmore dance posters, radical underground newspapers, and revolutionary hippie groups like the Jefferson Airplane and the Grateful Dead. However, freaky youth culture flowerings also popped up like little psilocybin mushrooms in a number of other West Coast towns, including Seattle, Bellingham, Eugene, and Portland. In retrospect 1965 was the turning point. LBJ accelerated the Vietnam War igniting the draft resistance movement. LSD hit school campuses. Light Shows emerged as a perception-altering visual augmentation at dances. In the wake of the Beatles’ influential psychedelic musical experiments on their Rubber Soul and Revolver albums a sizable segment of the youth population suddenly had no time left for “Louie Louie.” The first homegrown hippie bands like the Daily Flash, Emergency Exit, and Crome Syrcus were comprised of musicians who essentially shunned the R&B foundations of traditional Northwest sounds in favor of more experimental and eclectic musical vocabularies. But, of course, more was changing than simply the personal tastes of some musicians. In fact the whole music industry’s playing field was shifting. Record stores, record labels and radio stations were consolidating all across the land. The mainstream’s Top-40 AM radio empire was challenged by the newly emerging “underground” FM world. In the Northwest in particular, the long-established star structure that had supported the teen dance system was faltering as sock hops in school gyms and roller rinks gave way to freaky Happenings, Be-Ins, Acid Tests, Trips Festivals, and ultimately, huge outdoor Rock Festivals. By ‘67’s Summer of Love Seattle’s hip community had created a quite promising counter-culture. Now instead of continuing to attend teen-dances controlled by the city’s kingpin, Top-40 radio DJ Pat O’Day, kids had options: weekly light-show dances at the Eagles Ballroom. Instead of tuning into mainstream pop radio, hip locals could now hear alternative music on way-out stations like KRAB and KOL-FM. Rather than peruse mainstream papers radicalized youth could get their news in our local equivalents of California’s Berkeley Barb and Oracle papers, like the Helix, the Seer, and the Seattle Flag. In short: It was a new dawn. One of the few constants throughout the decade was the presence, in Seattle, of Jerry Dennon’s Jerden Records – a firm that, we recall, had first scored back in 1963 with the Kingsmen’s immortal “Louie Louie”. But throughout the sixties the label had consistently sought out local artists, produced recordings sessions, and released and promoted their records, scoring many radio hits along the way. Unfortunately, the late-‘60s proved to be an era when regional radio was condensing into larger corporate chains operated by absentee owners who had little motivation to support regional music. The result? While local labels like Jerden continued their efforts, indifference by the radio industry resulted in very few songs that broke out as full-fledged hits. Over the years, however, Jerden (and its family of subsidiary labels like Piccadilly and Panorama) still managed to develop a remarkably full catalog of Northwest rock recordings that, luckily for posterity, span a wide range of rock evolution during that decade. “It’s Tomorrow” was the exact sort of playfully stoned declaration that made a lot of sense to the new breed of young hippies who were finding their own life path in the mid-‘60s. Seattle’s Brave New World penned some typically addled lyrics about “green clouds,” and trees with “blue leaves.” The Seattle-based Jerden family of labels first issued a track by Brave New World on the Battle of the Bands Vol. II compilation LP which was produced at a time when the band stuck out like a sore thumb from most of their contemporary teen-R&B peer bands on that album. While most were still pounding out variations of sub-“Louie” type tunes, this band was already producing a musical vision on songs like “It’s Tomorrow” and “I See.” The Spindle provide us with a perfect example of an early branching of the new rock sensibility – and a tune that really shoulda been a hit! The band’s classic “Little Lies” explores a sort of middle path somewhere between Beatles-influenced pop and an exuberant folk-rock akin to San Francisco pioneers, the Beau Brummels. Charming stuff. In addition to the new bands, a few veteran bands from the ”Louie Louie”/garage rock era simply updated their image and sound continuing into the Psychedelic Era. Jerden Records felt strongly enough about a young Portland band, the New Yorkers, to win them a deal with the same big-time pop/R&B label that had taken on the Kingsmen, New York’s Scepter-Wand Records. Hopes were high, but unfortunately the tune, “Mr. Kirby,” with its faux-sitar embellishments and “high art” lyrics never managed to go beyond its status as a regional favorite and win the band a national audience. That process would take a few more years, a name change, and the group’s very own national TV program, the Hudson Brothers Show. Though few Northwest musicians of the Psychedelic Era made inroads into the national pop consciousness, this region did make contributions to the period’s zeitgeist. For example, in 1966 Northwest rock stalwarts, the Wailers – now in their psychedelic folk-rock phase – made early forays down to Haight Ashbury headlining over new bands like Quicksilver Messenger Service and Country Joe & the Fish at the Avalon and Fillmore ballrooms. Then too, Seattle rock veterans, the Frantics, headed to San Francisco in ’65 and basically never returned home. Their keyboardist eventually resurfaced playing with Quicksilver and a few other members soon popped up (with newly shaggy hair, love beads, and paisley shirts) in one of Frisco’s coolest new bands, Moby Grape. Then there was Seattle’s Daily Flash who expanded their following into California (where they performed concerts along with the Doors, Love, the Jefferson Airplane, Country Joe, and Quicksilver) and appeared on a few big-time TV shows. But back in Seattle, the Crome Syrcus was winning a following with their highly eclectic sound. Formed originally in 1965 the band became mainstays of the weekly dances at the Eagles hall (with: the Strawberry Alarm Clock, the Doors, Big Brother, Vanilla Fudge, and Iron Butterfly) and cut the very impressively acid-damaged LP Love Cycles along with a slew of lysergic singles including the ambitiously orchestrated “Elevator Operator” and the wah-wah spiked “Long Hard Road.” This fabulous furry band of freaks also made their way to Frisco and performed at the Fillmore and Avalon with the likes of Canned Heat, the Loading Zone, and Velvet Underground. Their greatest notoriety resulted though from an international tour they made in conjunction with the esteemed Joffrey Ballet Company, for whom they’d composed a soundtrack for a dance piece titled Astarte. While numerous local musicians heard the siren song calling from Haight Ashbury and made the irresistible pilgrimage southward, it must be noted that that path was not a one-way street and more than a few California musicians, tired of the circus atmosphere down there, headed north to quieter and greener pastures. Among the expatriots who settled in the Northwest in ’65 were members of the PH Phactor Jug Band. That band’s Seattle recordings showcase the same sort of revivalism of turn-of-the century Southern “jug band” music as also practiced in California by the Grateful Dead and Sopwith Camel. PH Phactor won the hearts of locals and their good-timey music was the soundtrack at many a groovy show between Seattle and Portland over the next few years. Signed to Jerden in ’67 the band cut numerous goodtime tunes including “Minglewood Blues,” “Barefoot John,” – and that timeless hippie holiday singalong, “Merryjauna.” The Magic Fern was a young band that formed in Seattle’s U District and became a top draw at Summer of Love dances with a sweet sort of Youngbloods-esque sound. They recorded a few singles for Jerden including “Maggie,” “I Wonder Why,” and “Beneath A Tree” and shared the stage with bands including: Country Joe, the Grateful Dead, the Jefferson Airplane, Big Brother, the Byrds, and the Seeds. Meanwhile, another of the old guard Seattle bands, the Dynamics, retooled themselves with a new name, image and sound. Abandoning the jazz-infused R&B that they’d been making since ‘59 and starting basically from scratch as the Springfield Rifle, the band began honing a new radio-friendly folk-pop sound. While not exactly rallying the era’s street revolutionaries, their pop-oriented songs like the moody, Beatle/Zombies-tinged, “Start At The Bottom” and the wistful harpsichord-laced “I Loved Her” did win significant airplay across the region. Airplay that, incidentally, caught the attention of the then-hot chart-topping LA-based group, the Buffalo Springfield. It was that group’s guitarist, Neil Young, who indulged in a little onstage griping in Seattle about how a certain local band (hmmm…) had ripped off his band’s name. Ouch! Interestingly, it was a different Seattle band, Bluebird that was actually considered by locals to be, musically, our own Northwest version of the Buffalo Springfield. Though Bluebird seemingly did possess a similar country/folk-tinged vibe on their original tunes – like “Goin’ Down,” and their metaphorical maritime epic, “Modessa” – they also blended in a certain jazzy element that helped make them quite popular on the scene. One long-standing teen-R&B band, Salem, Oregon’s Live Five, released a string of fun 45’s including their ‘67 single, “Move Over & Let Me Fly,” which evinces both tried-&-true Northwest teen-R&B underpinnings as well as freaky new musical ideas like the undulating “…fallin’ fallin’ fallin’…” refrain. Another veteran Northwest band that persevered into the hippie era, evolving their sound along the way, was the Bards. Originally formed in Moses Lake, WA as a typical Wailers-like teen-R&B combo, the Fabulous Continentals. Then in The Year Of The Beatles, 1964, the band adopted a British Invasion vibe and a new name – as the Bards the guys even covered the Who’s “My Generation” before honing a softer folk-soul sound with their big regional radio hit, ‘67’s “Never Too Much Love.” Songs like the countrified “Freedom Catcher” represented the final evolutionary phase of the band. Northwest rock had weathered a ton of changes over the years covered here – hell, what region’s music hadn’t?! But by 1969 the fabled Northwest teen scene was crumbling. The long-standing weekly teen-dance tradition had faded and giant outdoor rock festivals were on the rise. By the end of the sixties, just about all of the original recording studios – as well as the locally based record companies, including Jerden – had folded. Consider though: While times change and trends and fashions come and go, the heart of Northwest rock remains true. It seems that no matter what transpires, there is one factor that will never fade away... And that is the hold that “Louie Louie” has on us as a people. Thus we wind down with a final rendition of the region’s signature song as captured for posterity by a Seattle band, the Feelies. Though the song itself obviously harks back to an earlier era, this version displays a heaviness befitting 1968 – that godawful year of Memphis/Dr. Martin Luther King, L.A./Bobby Kennedy, Chicago/Mayor Daley, and ultimately: Washington D.C./Richard Nixon – “Louie Louie” somehow remains the most appropriate last word (well, two actually) to wrap up this look back at a long-gone era in Northwest rock.